The team have returned safely to the UK after successfully reaching Everest Base Camp. More photos are now in the gallery. Press release coming soon. Limited edition copies of selected Everest expedition images are now for sale. Glenn has suffered from birth with a bone condition commonly known as 'Brittle Bones' and has been confined to a wheelchair all of his life. He knows that even a simple fall could cripple him for life or kill him outright. The aim of the expedition is for the team to assist Glenn in achieving his ambition of climbing to Base Camp situated at 5500m (18,000ft) on the North Face of Mount Everest in Tibet. 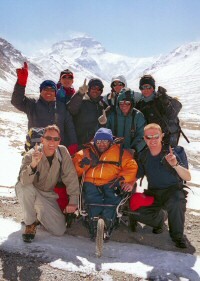 Glenn will attempt to wheel himself to the Base Camp with the aid of his unique Swiss-built 'Everest Wheelchair' which has been constructed by Invacare/Küschall to Glenn's specifications.